Homeschooling can be costly, but it doesn’t need to be. 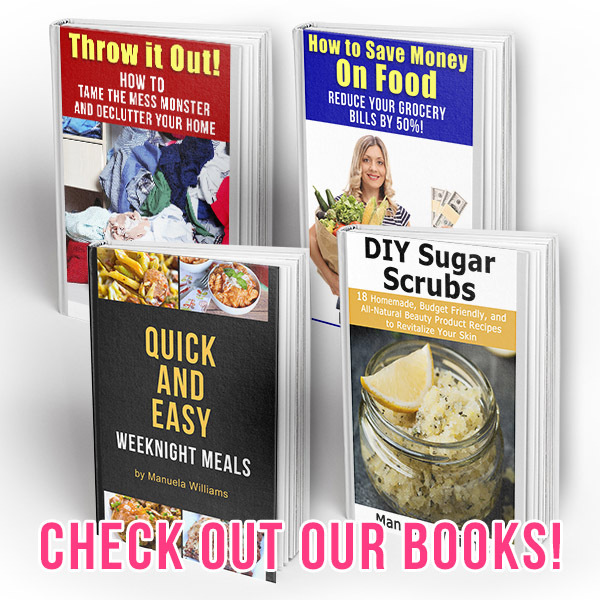 You can save a lot of money by utilizing all the free resources available on the Internet! 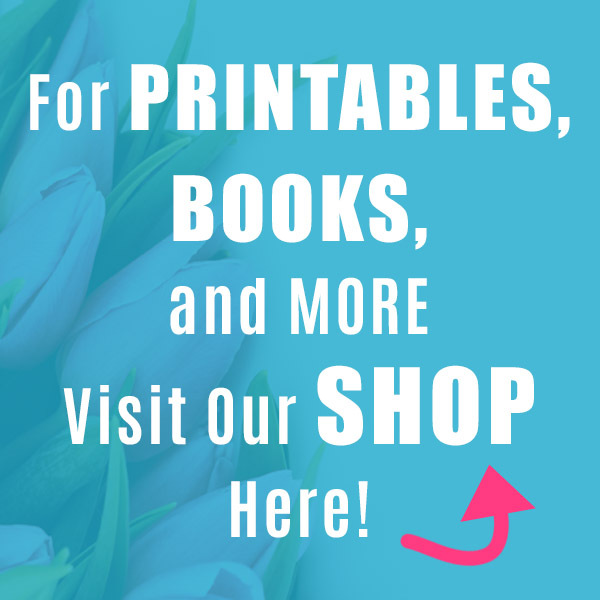 Especially printables! Pretty much any paper organizer or guide that you would find in a pricey homeschooling kit can be found online for free! 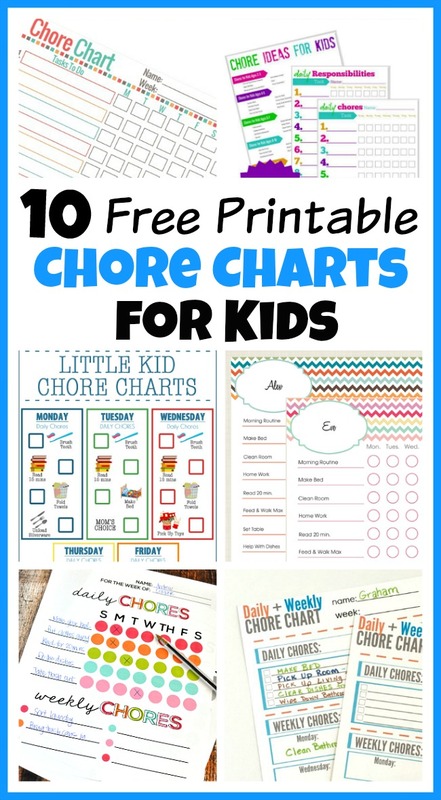 Of course, there are a lot of free printables out there to sift through, so to save you time I have gathered 20 Free Homeschooling Printables to help you cover the basics! 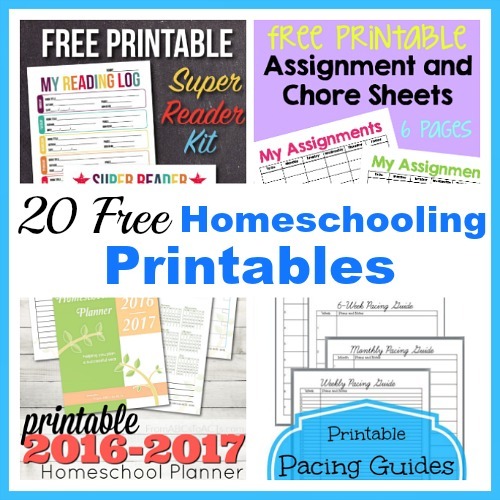 These free homeschooling printables are pretty much all that you need to start planning and organizing your homeschool. I’ve included planners, worksheets, report cards, blank lined pages, reading logs, and much more! 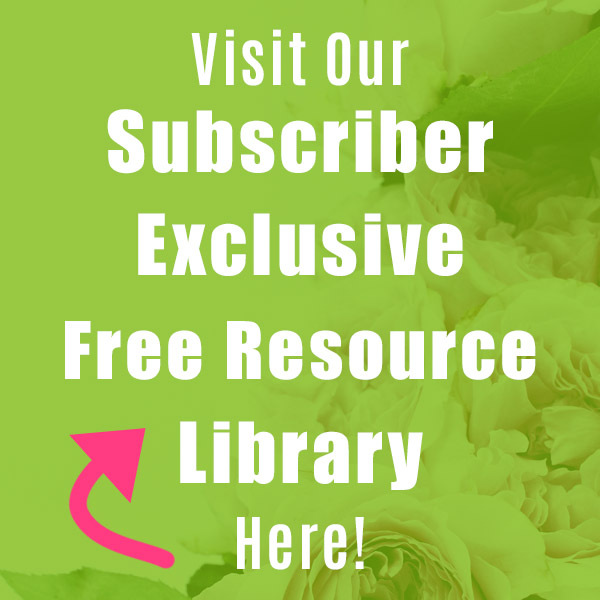 It’s amazing how many quality homeschooling resources are available online for free! 1. For preschool and early elementary students this Daily Calendar Page is a great tool. Grab it at the Homeschool Den! 2. 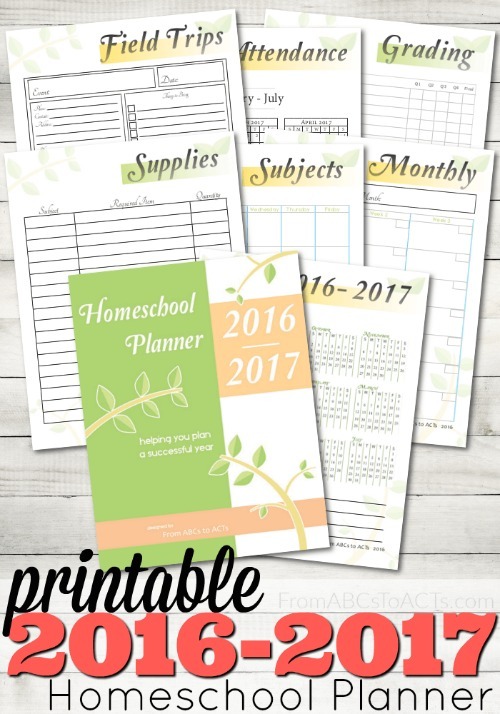 This printable 2016-2017 Homeschool Planner from ABC’s to ACT’s will come in very handy when planning out your school year! 3. Maybe this lesson plan book from Playdough to Plato is just what you are looking for. 4. Mama’s Learning Corner has a homeschool attendance record that is ideal for keeping a record, especially if your state requires an attendance submission. 5. Keep track of your child’s reading and encourage them on with this printable reading log and certificates from Homeschool on a Budget. 6. At A Little Pinch of Perfect, you’ll find this printable calendar that is great for laminating to use in your schoolroom (or schooling area). 7. Check out this Homeschool Portfolio printable from Hip Homeschooling that includes everything you need for tracking and documenting your child’s progress like reading logs, attendance, and achievements. 8. These Homeschool Planning Printables from The Crafty Classroom offer a variety of pretty calendars, planning, and goal sheets. 9. 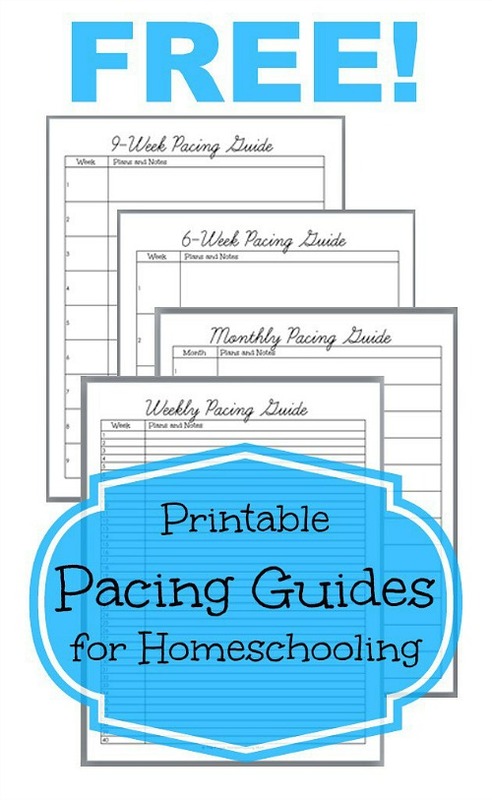 Create your own Pacing Guides with the help of these printables from The Frugal Homeschooling Mom. 10. Printable lined papers for school from Life of a Homeschool mom offer a variety of different types of lined paper for your needs. 11. Mom’s Master Binder from Hip Homeschooling is chock full of fun homeschool dividers, and the best part is you get to color them! 12. Have a kindergartner? This Kindergarten Assessment from The Relaxed Homeschool will help you find out just where they are. 13. 123 Homeschool 4 Me has these great blank, numbered Spelling Test worksheets. 14. Keep track of school days and grades using the Homeschool Attendance and Grade Printable from Meet Penny. 15. 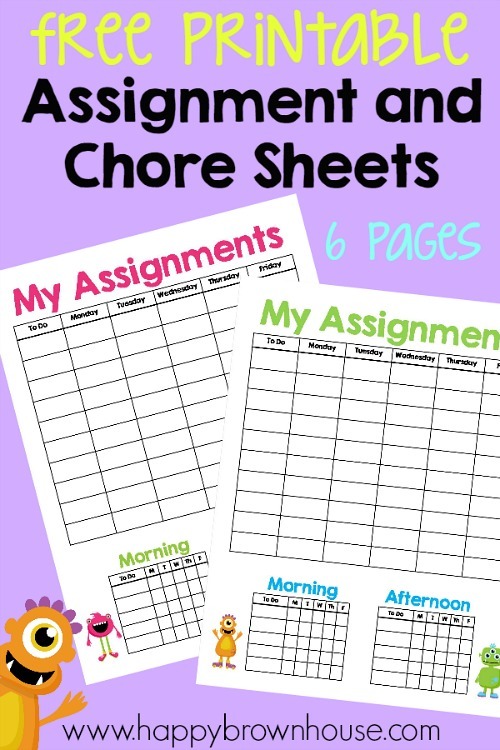 Homeschool Assignment and Chore Sheets from Happy Brown House may help make your homeschool days easier. 16. 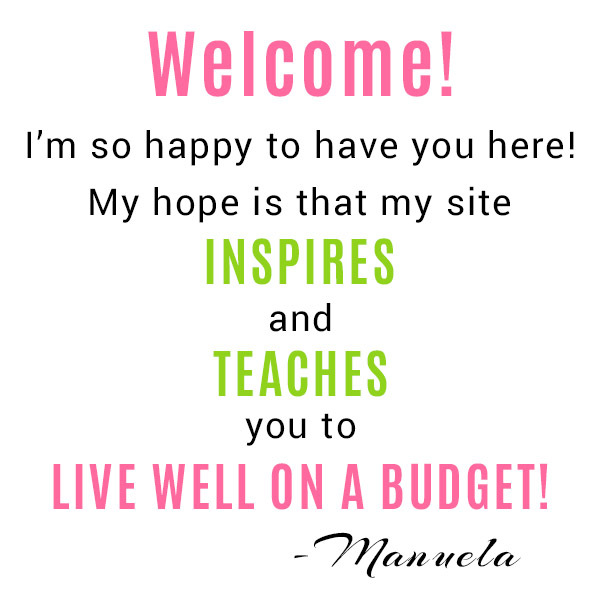 One of the first planners I ever used was from Living Well Spending Less. This simple Printable Homeschool Planner covers day, month, quarterly, and yearly assignments and goals. 17. If you are planning on keeping track of your child’s grades you can use this Homeschool Report Card Form from Blessed Beyond a Doubt. 18. Graph paper, a hundreds chart, number bonds, calendar, a number line, and more are in this printable Math pack at Five J’s. 19. Another great printable from Five J’s is this 2016-2017 Printable Homeschool Planner with over 200 pages. 20. Should you need to carry a proof of homeschooling for discounts, etc. a free printable Student ID Card from Paradise Praises makes it easy. Thank you so much for linking to our free calendar page! What a wonderful list you’ve compiled! Home schooling parents will love this collection. It seems so thorough. Thanks for sharing with us at Merry Monday.